A few weeks back, bedtime was spiraling out of control. The kids share a room; they would be wound up at bedtime and the transition to sleep was not happening smoothly. We had a big, big problem on our hands. We solved the problem with 10-minute reading time. The kids have to be in their beds. We dim the lights. We set a timer for 10 minutes. It has to be quiet during that time. Then we turn out the lights, do the picture (remember the elephants?) and sleep comes more easily. Tabitha, the other night, wanted to color. We talked and agreed that she could do it sometimes. As is the nature of 5-year olds, she soon wanted to know the limits. The following conversation took place on Wednesday night this week. To be clear. It was not my intention to get into a math conversation at this point. I just wanted her to go to bed. It’s time for a performance assessment. This is not multiple choice. If you have been reading along, you know that I advocate talking math with your kids as the mathematics equivalent of reading with them 20 minutes a day. Furthermore, you have surely read each of my thousands of words on Common Core’s vision of ratio, rate and unit rate. And yesterday I proposed a bit of alternate text for the Progression on Ratio and Proportion. Your assessment task is this. Imagine you have a 12-year old daughter. She has been learning about ratios and is assigned the task of finding real-world applications of them, as found in the media. She comes across an article that interests her. You strike up a conversation about the excerpt below. (1) The Common Core Progression on Ratio and Proportion will be helpful to you as a parent in discussing the relationship between this passage and her homework. (2) The distinctions being made (among ratio, rate and unit rate) in the Common Core Progression are useful and meaningful for interpreting this passage. (3) The discussion proposed in yesterday’s post will be helpful to you as a parent in discussing the relationship between this passage and her homework. (4) The distinctions being made in yesterday’s post (among ratio, rate and unit rate) are useful and meaningful for interpreting this passage. However, David Taulbee, Architectural Manager of Publix, notes that parking at many of their urban stores is full only at peak times, so that sacred parking ratio of five per thousand is called to question, particularly if the store has other parking options nearby like shared, on-street or bicycle parking. Your work will be scored on the basis of relevance and the use of evidence. It will not be scored on the extent to which you agree with the scoring committee’s views on these matters. I always appreciate when my local Cub Foods does the math for me. It saves me a lot of time. But what if I want 5? Or 17? OK. Quick survey. Two questions. Ignore all motivational and tangentially related conceptual issues. Accept for now that two people are using ratios to compare amounts of money. Jim has $300; Christopher has $250. The ratio of the amount of money Jim has to the amount Christopher has is 300:250. The ratio of the amount of money Jim has to the amount Christopher has is $300:$250. The question: Is one of these more correct than the other? Jim and Christopher notice that all of their money is in 10-dollar bills. Therefore, it makes sense to write their ratios in a different form. The ratio of the amount of money Jim has to the amount Christopher has is 30:25. The ratio of the amount of money Jim has to the amount Christopher has is $30:$25. Same question: Is one of these more correct than the other? What is the general principle at play here, in your view? And to what extent does that principle matter? OK, I get it. The Common Core State Standards are about large-scale coherence. Stay focused on the big picture of getting everybody going in the same direction, then tweak things later, blah, blah, blah… I get it. And yet kids’ education is at stake. And teachers’ jobs in the era of No Child Left Behind and Race to the Top. And the quality of curriculum that has to bend over backwards to align with these standards. I’m OK with this. I’m not thrilled with the “unit rate a/b” part, but it’s not a train wreck. Let’s look ahead to seventh grade, shall we? I walked one-half-over-one-fourth miles per hour. Does anyone ever talk about rates this way? Ever? I walked a half a mile in a quarter of an hour. Expectations for unit rates in this grade are limited to non-complex fractions. Computations with rational numbers extend the rules for manipulating fractions to complex fractions. Right, it’s this other odd obsession with complex fractions (i.e. fractions in the numerator and/or denominator). Function notation is not required in Grade 8. UPDATE: Reader Sean steps up to defend this standard in the comments below. I highlight his objections in a later post, and then respond in yet one more post on this topic. 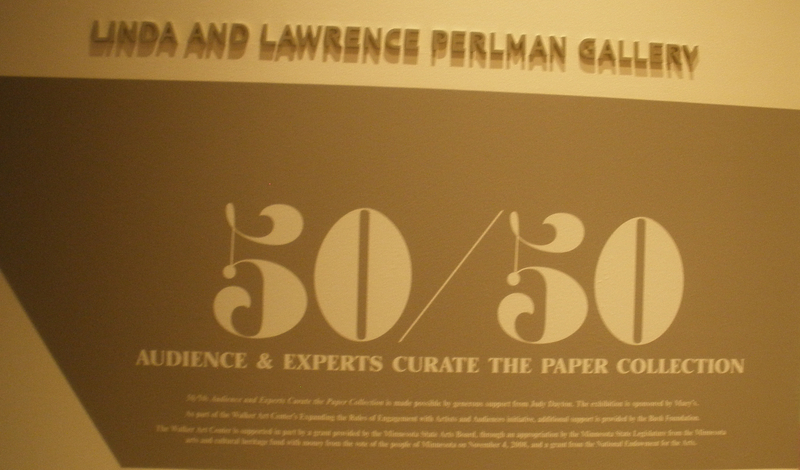 The Walker Art Center in Minneapolis has an exhibit titled “50/50”. The premise is that half of the exhibit was selected by public vote online and the other half of the exhibit was selected by museum curators in response to the public selections. In the photo below, we see the public half of the exhibit on the left. The curators’ side on the right is masked in black. In fact, you can only see about 2/3 of the public’s side; the remainder is past the left-hand edge of the photograph. (1) How many works are in the exhibit? (2) How many did the public choose? (3) How many did the experts choose? Click here to see the unmasked image. The museum claims approximately 200 works in the exhibit. Now how many do you think the public chose? NOTE: I shall return to gather the necessary missing data-photographs of the entire exhibit. I don’t count anywhere close to 200 total in these images.